We were in Colorado recently, closing the sale of the house that we lived in when my son was born. Our agent sent us the lock code so we stopped by one last time. I hadn’t seen the house since we left it almost five years ago. As we stepped through the front door, it was like looking back into a forgotten time of our lives. The house was smaller than I expected, but nostalgia has a way of making things bigger than they were. We went from room to room telling each other the stories that we remembered. There might have been tears, some of joy and some of pain and sorrow. The feelings that surfaced were raw and real and big. We continued on until we reached my son’s room. We made our first memories with our son in that house. I remember bringing him home and putting him in the crib that we assembled together. I remember sitting on the yellow rocking chair singing to him as we looked out his window. I remember long nights, and changing diapers, and feeling that new-parent fear. As we toured the house, my son listened and told us that he remembered things, too. He told me how I would be on my knees playing goalie, blocking his shots when we played hockey in the basement. He remembered us eating vegetables from our small garden. He remembered us playing in the backyard on his swing set that my wife and I put together. Fortunately, he didn’t remember that we finished it at midnight after too many bottles of wine. My son was two when we moved to a different house and then four when we moved to Philadelphia. I wasn’t sure how of the stories he told us he actually remembered. What he said most likely came from us looking at pictures and telling him the details many years later. But whether he was remembering our memories or his, there was one thing in his version that caught me off guard. That thing was me. I know why it caught me off guard, though. I had two drastically different experiences as a child with my father and my stepfather. My parents split up when I was two, and I lived with my mother and my sister. My father was only occasionally in the picture. Sometimes he would take me to a hockey game or a baseball game, and we did “second Christmas” with his side of the family. I remember the hockey games, watching the Whalers on the ice and I can still hear their song echoing in my memories. I remember going to Yankee games, going down to the edge of the field during warm ups and catching balls. But the thing missing from those memories is my father. My stepfather coming into the picture changed my life. My mother was much happier and I had someone who spent time with me. I have memories of my stepfather and I fixing bicycles in the driveway. I remember him driving our old wood-paneled station wagon towing our camper with me in the passenger seat on the two-way radio. I remember making him laugh when my mother was trimming his mustache and his face as he tried to fight back the smile. Featured in each of those memories is my stepfather. I’ve often thought about the difference in how I think about my father and my stepfather. About how one is still in my life and one is not. About how one is in my memories and one is not. Neither is perfect but at least one of them was there and still is there for me. 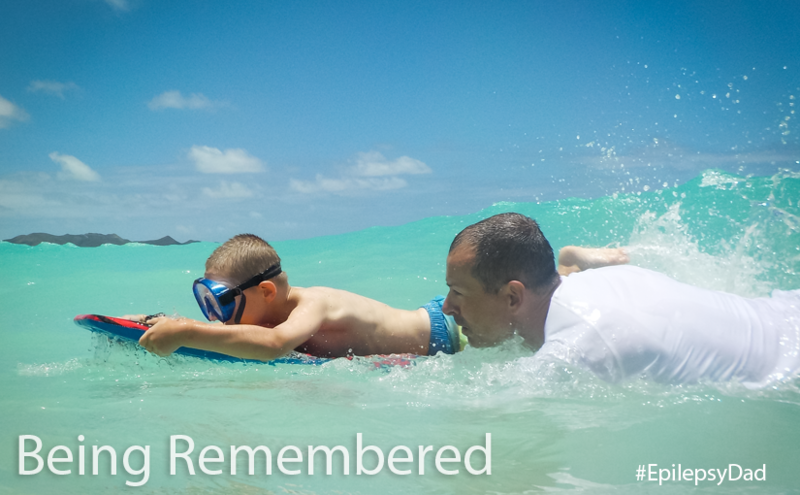 These experiences shaped what type of father I want to be to my son and how I want him to remember me. I want to be a part of his story. When he is telling his own children memories from his childhood, I want to be in them. I want him to see my face when he remembers that time he got a foul ball at a baseball game. I want him to remember me sitting on the couch next to him playing a video game or a board game. I want him to remember me helping him boogie board in Hawaii. I want him to remember with joy the “my dad always” remarks that show that I cared and was there. I want him to remember me, not for my sake, but for his. I want him to know and remember how important he was to me because I want him to feel important and loved. I want him to feel supported and strong. I want him to be a part of a childhood that set up for success instead of something that he will need to get over. My son is going to have enough things to overcome in his life. I don’t want him to ever question his worth or wonder where I was. Because I am here. And I love him more than anything. That’s how I want to be remembered.